Beta testers, get ready: Windows 8 is coming on Leap Day. The first public beta release that is, which keeps it on track for an October release. My colleague Joe Wilcox details the timeline in this post on Windows 8, which hints at Microsoft's announced date -- calling it "six or more weeks later" than the early January release of Windows 7's public beta. I'd say he was pretty close. 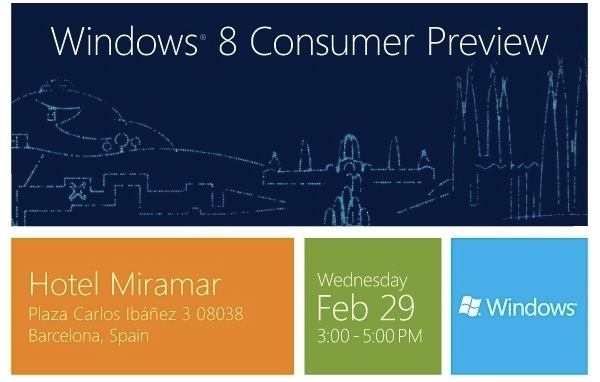 Microsoft is celebrating the release of the Customer Preview with an event in Barcelona, Spain on February 29, which is being held there to coincide with Mobile World Congress, also taking place during that week. That Microsoft is using MWC as its platform to launch a traditionally desktop OS reinforces how important the Redmond, Wash. company sees a merger of its desktop and mobile efforts. I won't be shocked if the majority of the presentation has a decidedly mobile feel to it. Despite Microsoft being a little later in its public release than Windows 7 was, the company still has six months to work out the beta bugs before a release to manufacturing in August. If it can make that August time frame, Microsoft could leverage the back-to-school shopping season by giving OEMs the opportunity to offer guaranteed upgrades to consumers purchasing PCs during that time (which traditionally occur over the summer). Microsoft could also opt to include the Consumer Preview on these machines, but it seems that an arrangement along the lines of the former is more likely. This will prevent the bastardization of PC purchases over the summer months. It also solves the issue of missing the back-to-school season, and holdouts. And the most important aspect of making that August RTM goal? An October release, and Windows 8 on computers for the holidays. With an insurgent Apple figuring out ways to sell more and more Macs each quarter, getting Windows 8 into partners' hands for the second biggest computing buying season of the year is pretty darn important. We'll monitor Mobile World Congress for Microsoft's announcement, and will have a first look at the Consumer Preview as soon as we can get our hands on it. Stay tuned.